My image of the early pioneers probably hails more from Little House on the Prairie than reality. I imagine a young couple, with two or three small children, trundling across the plains towards Colorado in a covered wagon with a few horses, a cow, some chickens, and a faithful dog that protects the family from marauding Injun’s and peckish rattlesnakes. With little experience but great ambitions, these young couples came out and founded communities all along the front range, striking out with boldness, foresight, and ingenuity. The reality, of course, is much more interesting. 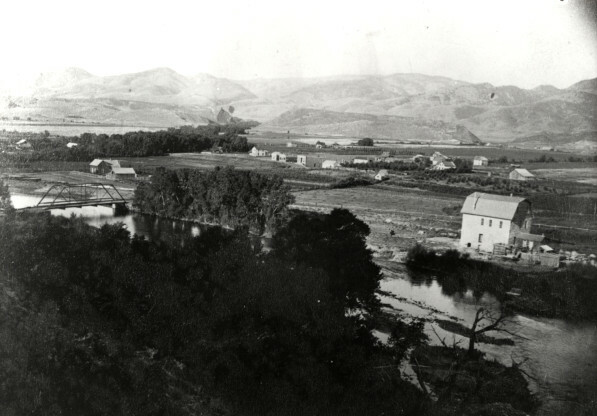 Jacob and Elizabeth Flowers, despite having a significant impact upon the Poudre river valley and particularly upon the community of Bellvue, didn’t arrive in Colorado until the later half of their years. Before reaching the state, Jacob had been an overseer on a plantation, a farmer, a ringmaster in a circus, and the owner/ operator of three steamboats on the Ohio River. 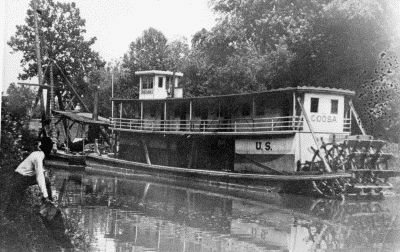 According to his daughter, Lydia, “They plied from Parkersburg, West Virginia to St. Louis, Missouri” and the family often traveled with Jacob on the boats. On March 30, 1865, two separate accidents resulted in the loss of two of Jacob’s steamboats, one of which he wholly owned (the “Malta”) and the other of which he owned one quarter share (the “Oil City”). Without any insurance, the loss hit Captain Flowers quite heavily. Though the family lore held that he loaded up his family and moved soon after, newspaper articles tell a slightly different story. 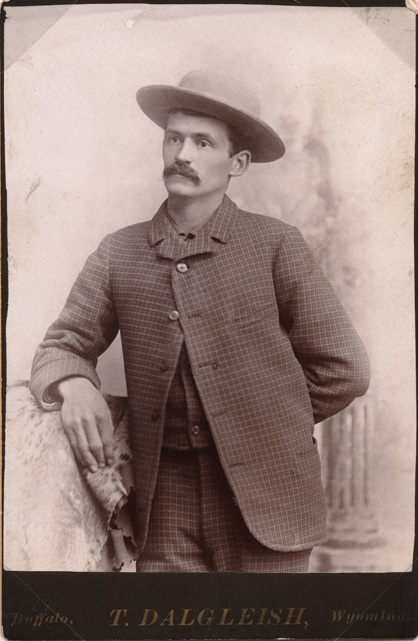 However, it does appear that by March or April of 1866, Jacob had loaded up his wife and six children (ages 11 years down to 7 months) into the remaining boat (the “Elk”) and moved them from their home in Wood County, West Virginia to Wyandotte, Kansas where he sold the boat and settled down. 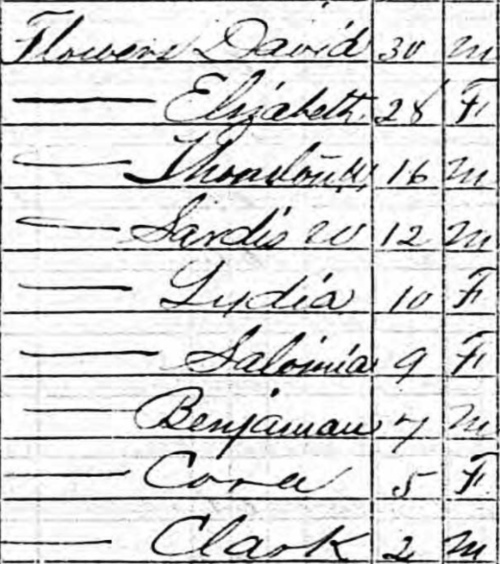 By the time of the 1870 census, Jacob was listed simply as a laborer. Some of the families that came out from Kansas liked the religious strictures under which the Union Colony was run. 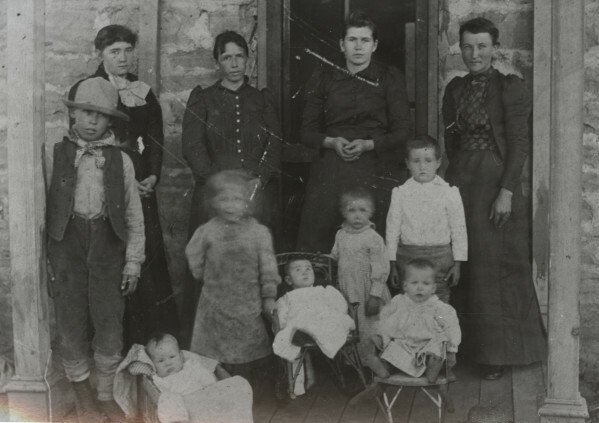 With no drinking and strong family values, women in particular felt like the colony would be a safe place for them to live and raise their children. Jacob Flowers, however, appears to have felt it was a bit too strict. Though some historians suggest that Flowers simply preferred a more diverse community of people to live among than what the tight-laced agricultural community in the Union Colony had to offer, I wonder if Jacob’s family didn’t play some part in helping him to decide to move on. Flowers and Laidlaw had already scouted the land the previous year. They must have learned about the colony at that time and used that knowledge to convince the families of Wyandotte to join them in the move west. The only thing that changed between Jacob’s visit to the area in the fall of 1872 and his move to the community in the spring of 1873 was that his wife and children were with him the second time around. And by this point, his oldest son, Thornton Wesley, was almost nineteen years old. And the next youngest, Sardis, was sixteen and a half. I can just imagine their faces as they learned that they were about to join a temperance colony. (What self-respecting teenager is going to be able to feel his oats without sneakin’ a drop of drink now and again?) I wouldn’t doubt that Thornton and Sardis helped convince their dad to keep moving before settling down. 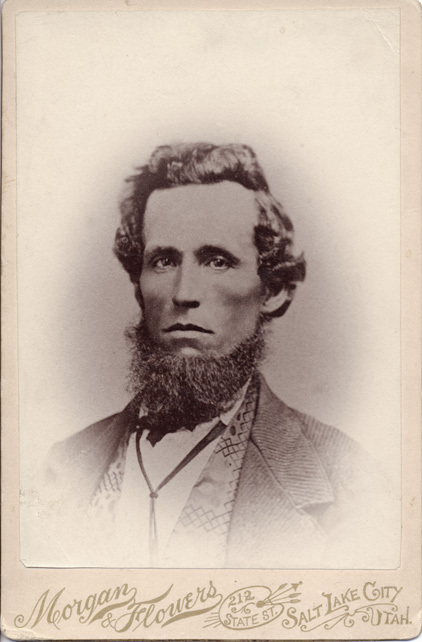 The Flowers family lived and farmed north of Fort Collins for a year before making a deal with Joseph Mason to trade the land they still owned in Kansas for a plot in Pleasant Valley that was owned by Mason. 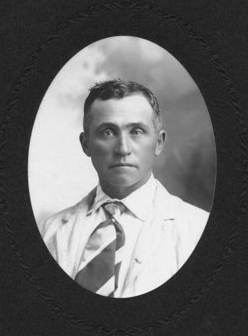 The family’s first crop in 1874 was lost to grasshoppers and it was probably with that loss that Jacob realized he was going to have to diversify in order to ensure he could feed his family of 8. He bought a sawmill in the Buckhorn region and also began to do some street/bridge work for the county. In 1879, he was elected to be the first president of the Pleasant Valley and Lake Canal Company. That same year he also surveyed a route over the Continental Divide and secured funds from the County to build the road that would provide access to both North Park and Hot Sulphur Springs. It’s now called Old Flowers Road. 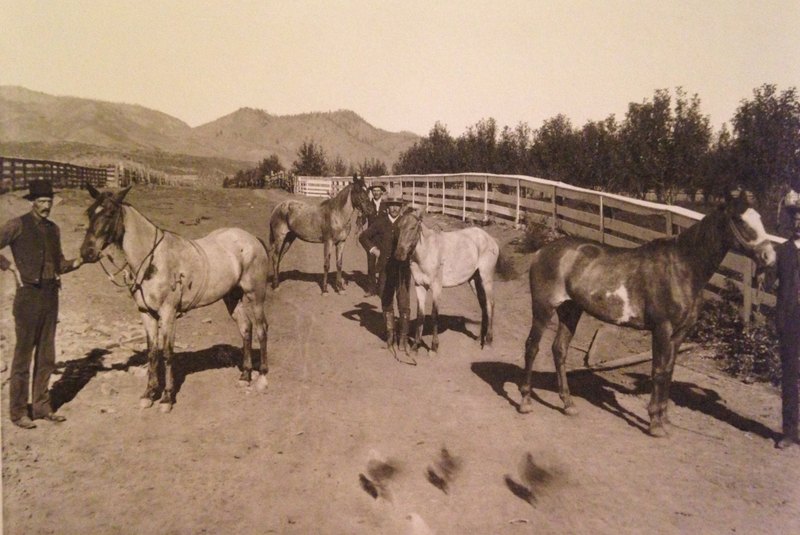 In 1880, the family moved to a new parcel of land in Pleasant Valley located right along Rist Canyon Road. It was on this spot that Jacob (now in his early 50s) built the house we now know as the Jacob and Elizabeth Flowers House. He used locally quarried stone and set the house well back from the street. He also planted an orchard, showing that fruit trees would do well in the area. Jacob then bought 80 acres just to the south of his property from George W. Fisher. He platted a town and named it Bellevue, French for “beautiful view.” He built a mercantile store at the intersection of two important roads through this new town — Rist Canyon Road and County Road 23 (Front Street) — recognizing that with timber being hauled down from the mountains, and quarrying taking place just to the south in Stout, his store would be at an important crossroads. He used the same locally quarried stone that had been used to build his house. The store building is now called the Bellvue Grange. You can read more about it in this post — The Bellvue Grange is All Lit Up. Jacob turned the mercantile store into a hub of activity in the valley, offering hot coffee and snacks as well as the heat of a pot-bellied stove, and a pool table and card tables for the locals to use. He also added a saloon in the store and built a baseball diamond, a horse race track, a bandstand, and picnic grounds in the area. (Can you see why he might not have fit in so well in the tight-laced Union Colony over in Greeley?) Jacob also grew additional garden produce and raised extra hogs in order to set aside food for those in need in the community. 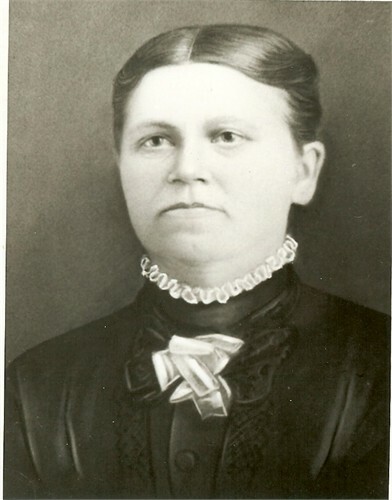 In the fall of 1890, Jacob’s wife, Elizabeth, passed away at the age of 60. She was buried in the Grandview Cemetery in Fort Collins. In 1896, the town of Bellvue was incorporated. The community was thriving as an agricultural center, a timber source, and as a base for those working in the nearby quarries. But on November 15, 1900, Jacob Flowers unexpectedly passed away. One minute he was eating dinner. The next his heart had given out. He was 73 years of age and had become a well loved member of the Northern Colorado community — affectionately called “Uncle Jake” by many who knew him. 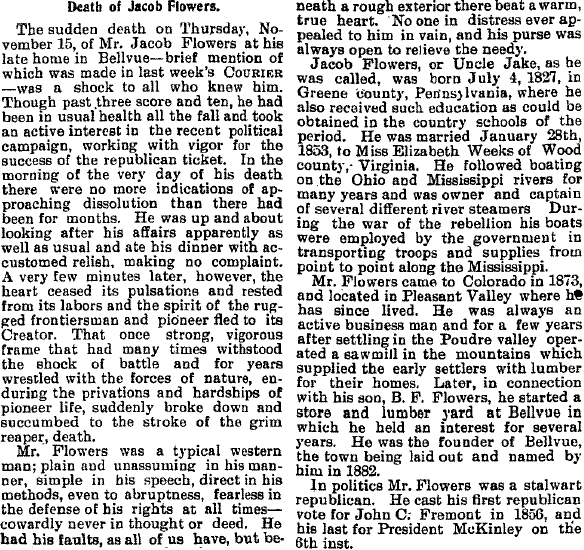 Jacob Flowers’ obituary in the November 22, 1900 Fort Collins Weekly Courier. Despite the fact that Jacob lived less than a third of his life in the area, he had a significant impact upon both the land and the people. Despite my pre-conceived notions of the early pioneers coming out as strapping young studs, ready to take on the world, Jacob Flowers’ story just goes to show that even when we’ve reached our middle years and it might feel like our most interesting times are already behind us, we’re still not too old to have a significant impact upon our communities. Watrous, Ansel. The History of Larimer County. p. 189. A significant portion of the information from before the Flowers family moved to Colorado came from research done by Jeanne Flowers in her study of “Thomas Flowers of Maryland,” as found on RootsWeb.com. Jeanne Flowers dug up several helpful newspaper articles which she quotes in her article and which help to identify the circumstances and timing around Jacob’s ship mishaps and final decision to move to Kansas. The quote from the West Virginia Weekly Times came directly from Jeanne’s article. 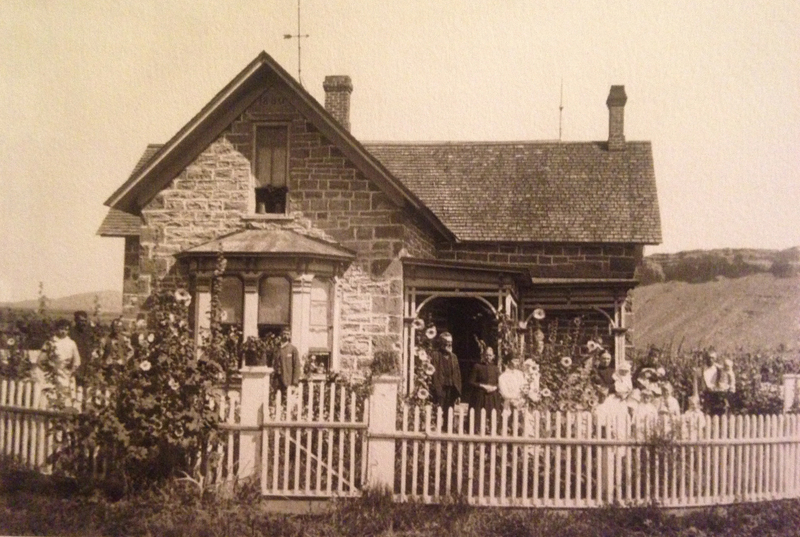 I found a significant amount of information about the Flowers family in the historical backgrounds that Ron Sladek wrote for the nominations of both the Flowers house and store for the National Register of Historic Places. You can read both of these documents online: Jacob and Elizabeth Flowers House nomination form and Flowers Store / Cache La Poudre Grange #456. The number of families that chose to move to Colorado from Wyandotte, Kansas was listed as 25 in some sources, but it was stated to be 13 in May 20, 1923 article in the Fort Collins Express. So I chose to go with that number. I still wonder where Clark and George Flowers were buried. On FindaGrave they’re listed as being buried at Grandview Cemetery, but in talking with the staff there, they stated that the headstones there are simply cenotaphs (memorials). So the boys are probably in Wyandotte, but I’m not sure where.